Handling images in an application is a common problem for many beginning Java programmers. 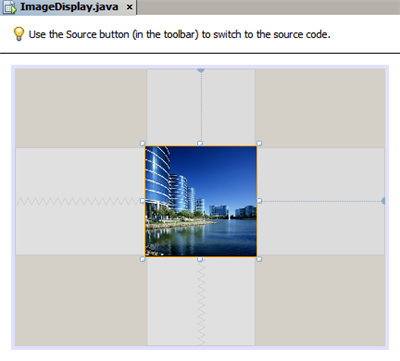 The standard way to access images in a Java application is by using the getResource() method. This tutorial shows you how to use the IDE’s GUI Builder to generate the code to include images (and other resources) in your application. In addition, you will learn how to customize the way the IDE generates image handling code. The application that results from this tutorial will be a simple JFrame that contains one JLabel that displays a single image. 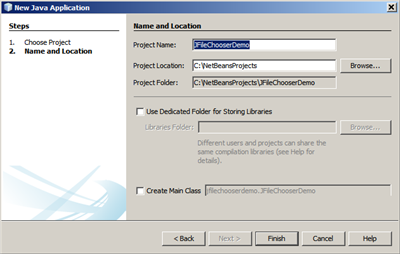 In the New Project wizard, select Java > Java Application and click Next. For Project Name, type ImageDisplayApp. Clear the Create Main Class checkbox. In this section, you create the JFrame form and add a JLabel to the form. 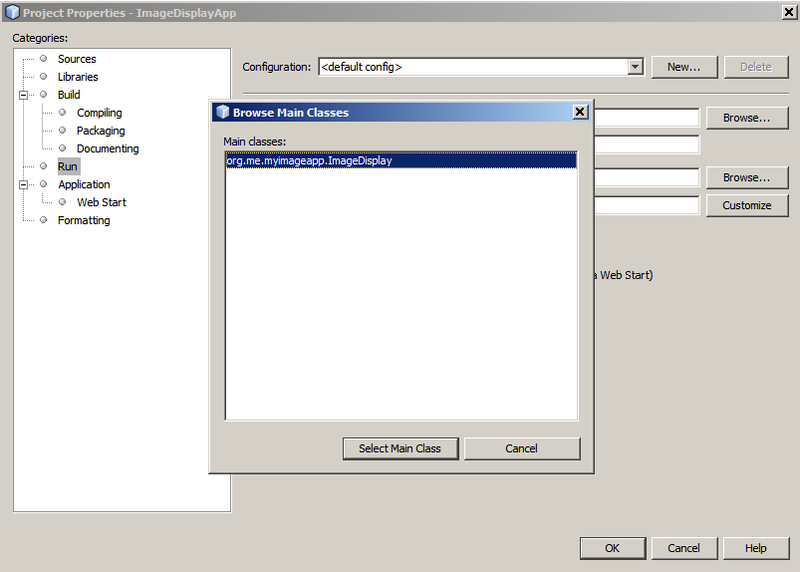 In the Projects window, expand the ImageDisplayApp node. Right-click the Source Packages node and choose New > JFrame Form. For Class Name, type ImageDisplay. For Package Name, type org.me.myimageapp. 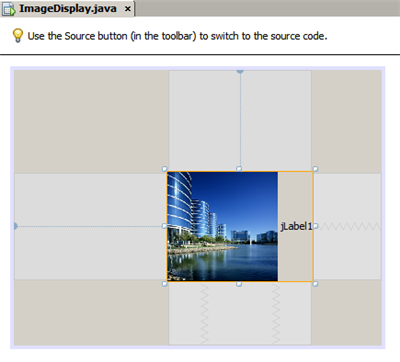 In the Palette, select the Label component and drag it to the JFrame. When you use images or other resources in an application, typically you create a separate Java package for the resources. On your local filesystem, a package corresponds with a folder. 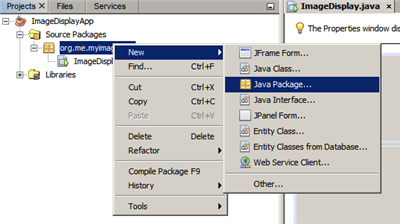 In the Projects window, right-click the org.me.myimageapp node and choose New > Java Package. In the Projects window, you should see a new package appear within the Source Packages folder. In this application, the image will be embedded within a JLabel component. In the GUI Designer, select the label that you have added to your form. In the Properties window, click the Properties category and scroll to the Icon property. Click the ellipsis (…​) button. The icon property editor is displayed. 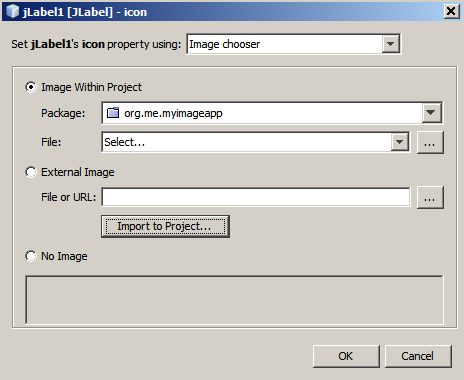 In the icon property dialog box, click Import to Project. In the file chooser navigate to any image that is on your system that you want to use. Then click Next. 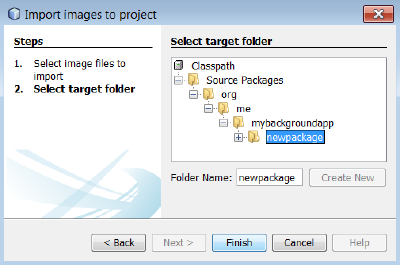 In the Select target folder page of the wizard, select the newpackage folder and click Finish. Click OK to close the icon property dialog box. Copies the image to your project. Therefore, when you build and distribute the application, the image is included in the distributable JAR file. Generates code in the ImageDisplay class to access the image. Displays your image on the label in the Design view of your form. 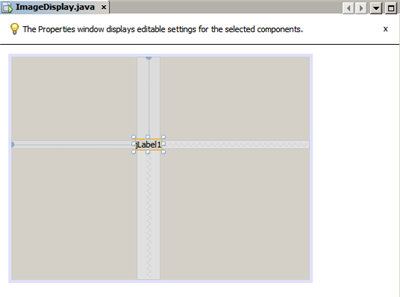 In the Properties window, select the text property and delete jLabel1. That value was generated by the GUI Builder as display text for the label. However, you are using the label to display an image rather than text, so that text is not needed. Drag the jLabel1 to the center of the form. Scroll down to the line that says Generated Code. Click the plus sign (+) to the left of the Generated Code line to display the code that the GUI Designer has generated. Since you have used the property editor for jLabel1’s `Icon property, the IDE has generated the setIcon method. The parameter of that method contains a call to the getResource() method on an anonymous inner class of ImageIcon. Notice that the generated path for the image corresponds with its location in the application’s package structure. If you use the External Image option in the icon property editor, the IDE will generate an absolute path to the image instead of copying the image to your project. Therefore, the image would appear when you run the application on your system, but it would probably not appear when running the application on another system. The getResource method is also useful for accessing other types of resources, such as text files that contain data that your application might need to use. In the Design View, right-click the JLabel and choose Events > Mouse > mouseClicked/mousePressed/mouseReleased from the popup menu. An event handler is generated for the corresponding event. You can get the mouse coordinates (for example, the location of a mouse click) in the event handler using the event.getPoint(), event.getX(), or event.getY() methods. See Class MouseEvent for details. Now that you have generated the code for accessing and displaying the image, you can build and run the application to ensure that the image is accessed. First you need to set the project’s main class. When you set the main class, the IDE knows which class to run when you run the project. In addition, this ensures that the Main-Class element in the application’s JAR file is generated when you build the application. Right-click the ImageDisplayApp project’s node and choose Properties. In the Project Properties dialog box, select the Run category. Click the Browse button that is next to the Main Class field. Then select the org.me.myimageapp.ImageDisplay class. Click the Select Main Class button. Choose Run > Clean & Build Project (project_name) from the main toolbar. You can view the build products of the application in the Files window. The build folder contains the compiled class. 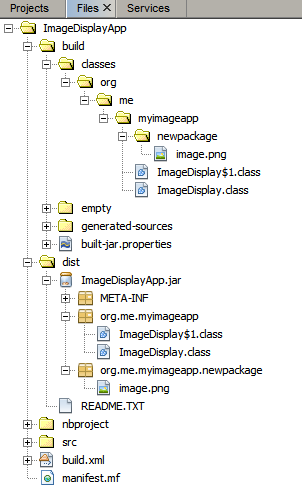 The dist folder contains a runnable JAR file that contains the compiled class and the image. Choose Run > Run Project (project_name) from the main toolbar. In many applications, the image that is displayed is not determined statically like it is in this example. For example, the image to display might be determined by something that the user clicks. If you need to be able to choose the image to display programmatically, you can write your own custom code to access and display resources. The IDE prevents you from writing code directly in the Source view’s "guarded blocks" that contain code generated by the GUI Builder. However, you can insert code in the guarded blocks through property editors that you can access through the Properties window. Using the property editors in this manner ensures that your custom code is not lost when you make design changes in the GUI Builder. Select the JLabel in the Design View or in the Navigator window. In the Properties window, click the ellipsis (…​) button that is next to the icon property. From the dropdown list at the top of the dialog box, select the Custom Code option. The Custom Code option in this property editor lets you fill in the parameter of the setIcon method yourself. You can fill in this parameter with the necessary logic or with a call to a separate method that you have hand-coded elsewhere in the class. 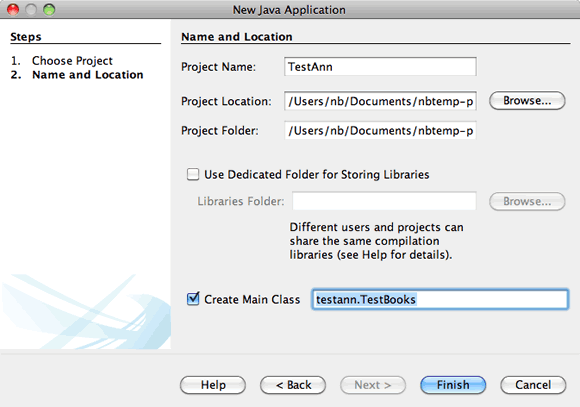 This tutorial has shown you how to access images from an application that you create in the NetBeans IDE. Image handling is further discussed in the Java Tutorial. *Note: *The example given in this tutorial is very similar to the first example in the How to Use Icons section of the Java Tutorial. One difference is that the code that is generated when you follow this tutorial uses JLabel’s `setIcon method to apply the icon to the label. In the Java Tutorial example, the icon is applied to the label by being passed through its constructor.